Whether or not you’re planning a stay at The Plaza Hotel in downtown Las Vegas, there’s one entertainment offering at the property you’ll do well not to miss: “The Scintas and a Steak” dinner-and-a-show package. The experience combines a three-course prix fixe dinner at Oscar’s revered “Beef, Booze & Broads” Steakhouse with a VIP ticket to The Scintas—a wildly entertaining comedy and musical variety-style show currently running in the hotel’s swanky showroom. This fabulous food-and-theater package combines delectable cuisine at a top-notch eatery with world class entertainment. Of course, any dinner-and-a-show package starts with, well, dinner and this one doesn’t disappoint. Oscar’s, owned by Oscar Goodman who spent 12 years as mayor of Las Vegas, offers a classic steakhouse prix fixe that starts with a fresh and crisp Caesar salad (that is thankfully not over-dressed), and then moves on to a choice of two entrée options: Chicken & Artichokes served with mashed potatoes, or an Eight-Ounce Filet Mignon also served with mashed potatoes plus asparagus. My party chose to try one of each, and the proteins in each entrée were notably juicy and well-seasoned, befitting a high-end steakhouse. Dessert is a sumptuous Chocolate Mousse, a dish they have clearly perfected. Of course, if you have a hankering for something on Oscar’s regular gourmet menu, feel free to order, though with the understanding it won’t be covered under the $99 prix fixe show package price. And temptations do abound. Known for perfectly aged steaks cooked flawlessly over a 600-degree grill, Oscar’s regular menu serves up a menu of gourmet dishes to please a wide range of tastes. Signature dishes include Joey C’s Filet, an eight- or 12-ounce filet served Oscar-style with Béarnaise sauce, lump crab and asparagus, if desired. You can also find several “surf” options here, such as the Crab Cake appetizer, made with fresh lump crabmeat and served with pepper remoulade and stone ground mustard that some say is the best in town. If you have your heart set on a steak (and who could blame you?) and like to turn up the heat, try the Spicy Flame-Charred Spilotro Steak that’s flavored with red chili flakes and garlic, served alongside Ralph’s smashed potatoes. Food aside, guests at this eatery enjoy vintage Vegas ambiance thanks to on-point décor that calls to mind the bygone Rat Pack era amid thoughtful touches like plush velvet booths and original crystal chandeliers. Not surprisingly, celebrity sightings are known to occur here but, in true old-school Vegas style, Oscar’s doesn’t divulge the identities of its guests—high-profile or otherwise. But do keep an eye out,ff as you just might have an A-list sighting. With “The Scintas and a Steak” package comes a VIP ticket to this superb show, complete with preferred seating, a complimentary cocktail and an autographed photo. 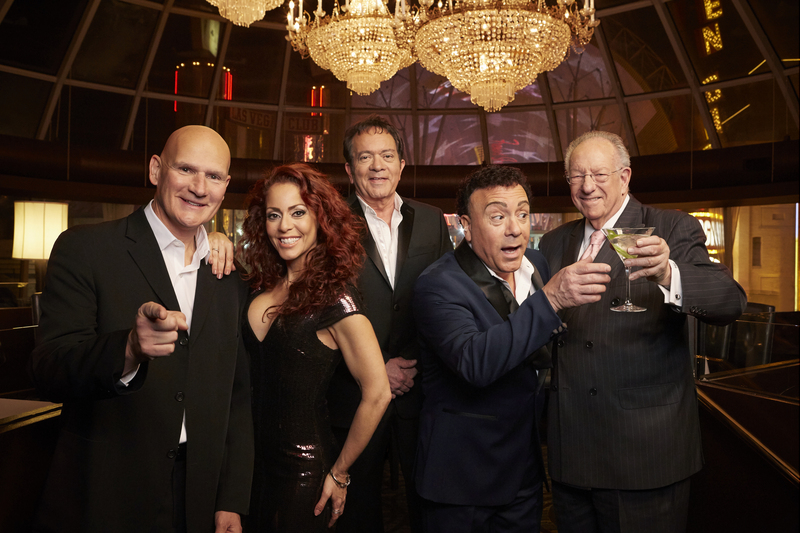 Known as “Las Vegas’s first family of entertainment,” The Scintas bring their legendary show to The Plaza Hotel and Casino, running as a limited engagement through May 14. The Scintas is made up of multi-talented brothers Frankie and Joe, along with musician and “honorary Scinta” Peter O’Donnell and, the newest member, the lovely and gifted Janien Valentine. Together, the group puts on an engaging show, a mélange of vocal ability, music artistry, showmanship, wit (some a bit hilariously off-color) and timing. A Vegas fixture, The Scintas have performed for hundreds of thousands of people over the last 16 years and are revered for their signature humor, uncanny (and hysterical) impressions and overall musical prowess. With Valentine’s powerful and moving vocals added to the mix and the fact that she’s an undisputed beauty, the show offers something for anyone who is fun-loving and musically-inclined. When I procured tickets to the show I had no idea what to expect and falsely assumed the show was more appropriate for an “older crowd.” I was pleasantly surprised to learn that this isn’t the case at all, as the show features a blend of classic musical numbers spanning generations and genres. You’ll hear everything from Dean Martin and Ray Charles to Michael Jackson, Whitney Houston and The Rolling Stones–all the way to Bruno Mars. All of this interspersed with endearing, relatable humor that will have you smiling while clapping along, ultimately leaving you feeling as if you’ve spent the evening hanging out with family. Indeed, this show’s unique mix of music and comedy appeals to guests of all ages and from all walks of life, and it fits in beautifully with the vintage showroom atmosphere at The Plaza.